Urban Simplicity: Mului and his new bike! Mului and his new bike! Nearly a month ago I posted a fundraiser request to get fellow co-worker Mului a new bike (click here for that post, or here for the original Go Fund Me page). At the time I was impressed (but mostly moved) by the fact that what I thought would take a week or two to raise the money only took an hour-and-a-half! Well the check finally came in and I was able to pick up his new bike with him today. 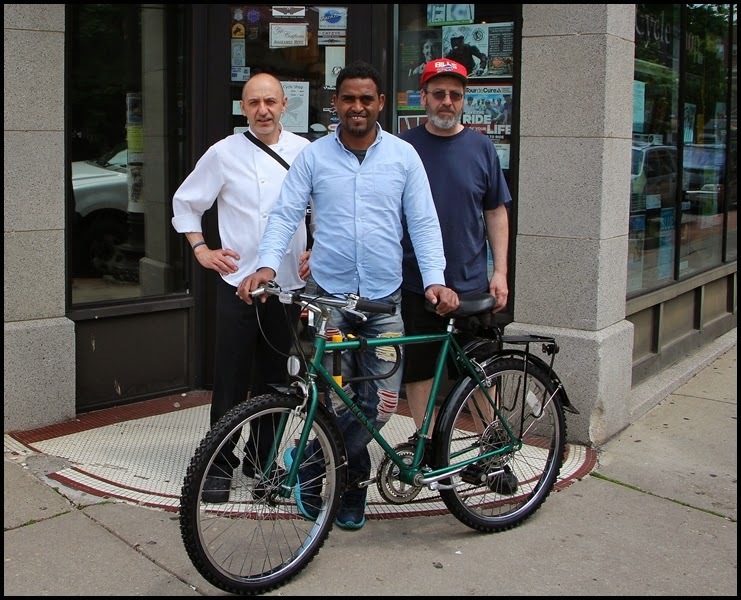 In the picture above (from L to R) is yours truly, Mului, and Tom, the owner of Rick Cycle that helped put the bike together for us. I just wanted to say thank you again to all who helped with the donations.